What's Up With Exclamation!!! Marks!!! Between!!! Words!!!? People have been using multiple exclamation marks for emphasis since before we started having strong feelings about things on the internet. More advanced variants include "omg!!!!1!!11!!" (so excited you forgot to hold down the shift key) and "omg!!!1!eleventy!!1!" (deliberate parody of people who are so excited they forgot to hold down the shift key). 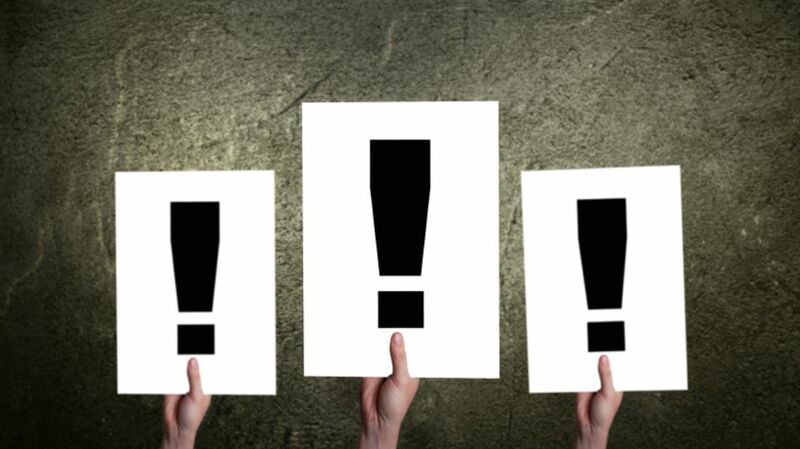 But there's an interesting new trend arising in the world of multiple exclamation marks: some people have started putting multiple exclamation marks between individual words. This style creates a digital tone of voice that's a combination of multiple exclamation marks!!!! and Deliberately. Stopping. Between. Every. Word. YOU!!!! CAN!!!! NOT!!!! BE!!!! ANTI!!!! SOCIAL!!!! TO!!!! THEM!!!! The effect, especially combined with all-caps, is like grabbing your interlocutor by the shirtfront and giving them a shake with every word you shout—certainly not something you want to do all the time, but very effective in limited quantities. There are a few precursors to the current trend of exclamation marks between words: Saint-Louis-du-Ha! Ha! is the name of a real town in Quebec (it's located, naturally, on the River Ha! Ha!, which flows from the Lake Ha! Ha!). S!MT!!OE!!! - standing for "Sets! My teeth!! On edge!!!" It goes 'baa!' It is a sheep! [...] That! Is!! Not!!! My!!!! COW!!!!! And the line "THIS! IS! SPARTA!!!" from the movie 300 is sometimes written with escalating exclamation marks. But the newer examples don't tend to escalate: they use the same number of exclamation marks (often three or four) between every single word. IF!!!! YOU!!!! TRY!!!! THIS!!!! BE!!!! CAREFUL!!! !